Any time you can turn your fruit into a vehicle for delicious toppings and call it a “boat,” mealtime instantly becomes 50% more fun. After making these gorgeous papaya boats, I couldn’t let the fun stop there. I’ve been an avocado fiend lately – as in I eat half of one almost every day! So I couldn’t resist the urge to turn them into a complete meal. I’m absolutely smitten with this buttery green fruit (yes fruit!). Avocados are beautiful, nutrient-rich, loaded with healthy fats, and wonderfully versatile. Let’s not only make them into guacamole or smash them on toast, friends! Let’s dream bigger. This recipe has two options! The first is inspired by both Indian and Mediterranean cuisines with crispy, masala-spiced chickpeas and a maple-lemon tahini sauce. The second is influenced by Mexican cuisine with spicy black beans, taco-inspired toppings, and salsa or hot sauce. Serve this version with tortilla chips for a hearty meal or side dish. If you give this recipe a try, let us know what you think! Leave a comment and rate it, and don’t forget to take a picture and tag it #minimalistbaker on Instagram! We love seeing what you come up with. Cheers! Easy Avocado Boats 2 ways! Fill with seasoned black beans and taco-inspired toppings, or crispy chickpeas and tahini sauce! A simple, flavorful plant-based meal. 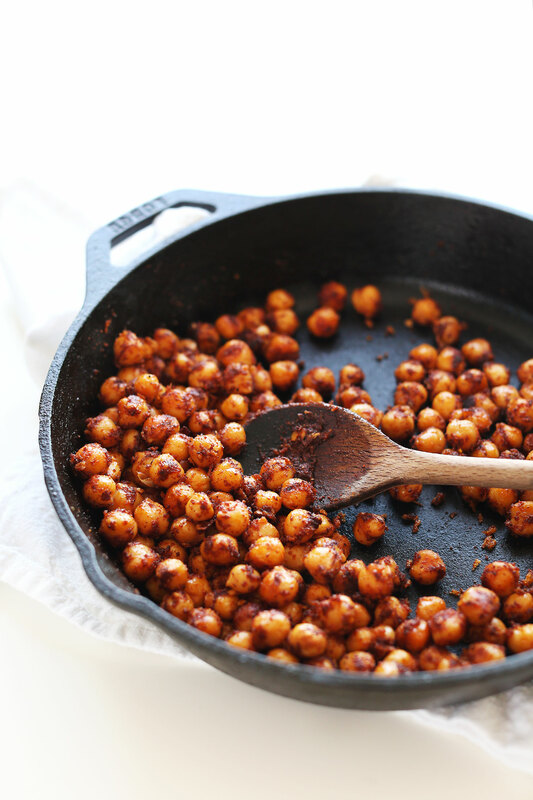 FOR CHICKPEAS: Heat a large skillet over medium heat. 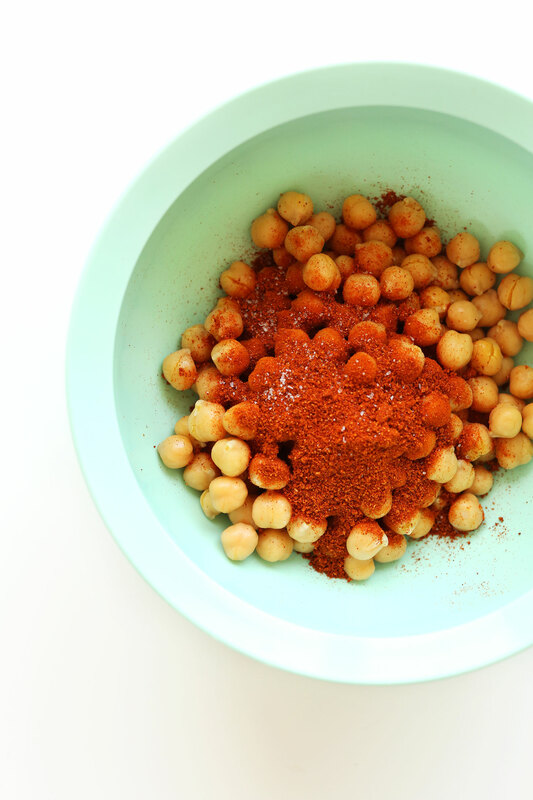 While it heats, add drained/dried chickpeas to a mixing bowl and toss with sea salt and masala spice blend. Once skillet is hot, add oil and chickpeas to pan and sauté, stirring frequently, until slightly crispy and browned - about 8-10 minutes. If browning too quickly, turn down heat. Once the chickpeas are browned and fragrant, remove from heat and set aside to cool. Taste and adjust seasonings as needed, adding more salt or masala spice as desired. Prepare desired sauce at this time (see recipes / instructions by following the links above). To serve, halve avocados and remove pits. 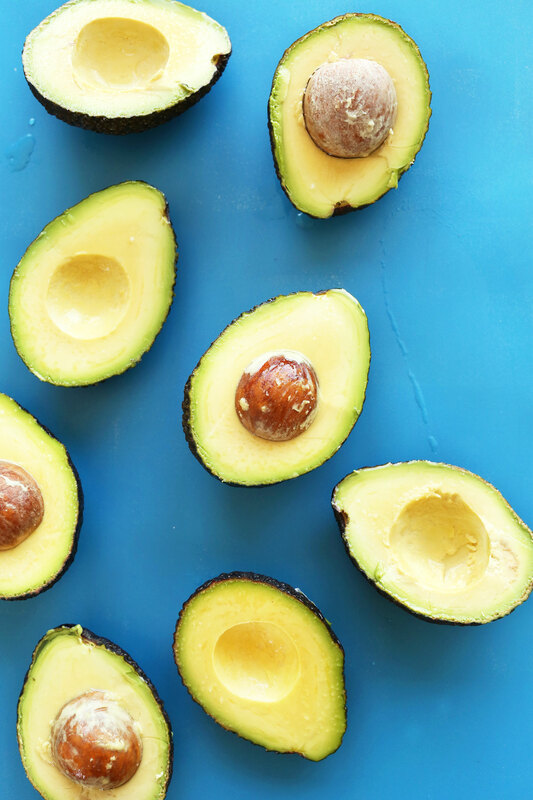 You can either scoop out the avocado or leave it in the skin (removing it from the skin is a little more messy, but it does make it easier to eat). 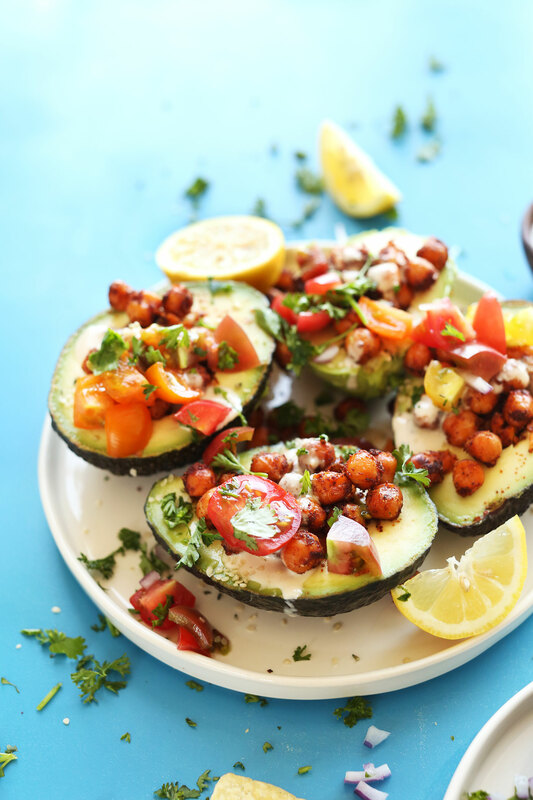 Top avocados with a generous squeeze of lemon juice, chickpeas, parsley, tomatoes, onion and desired sauce. Serve immediately - best when fresh. FOR BLACK BEANS: Add slightly drained black beans to a small saucepan and season with cumin, garlic powder and chili powder. If unsalted, add 1/4 tsp sea salt (amount as original recipe is written // if altering batch size, use 1/4 tsp per can of beans). Stir to combine. Cook over medium heat for 10 minutes, or until bubbly and warm. While beans are cooking, prepare any desired toppings. Top avocados with a generous squeeze of lime juice, black beans, cilantro, onion, and desired sauce (I went with salsa and hot sauce). Serve immediately as is or with tortilla chips - best when fresh. NOTE: Both styles of avocado boats are delicious on their own, but they would also go well atop a green salad. *I bought my Tandoori Masala blend at Whole Foods and it was spot on and delicious! If you can't find it, make this DIY Tandoori Masala Blend: 3 Tbsp cumin, 2 Tbsp garlic powder, 2 Tbsp paprika, 3 tsp ginger, 2 tsp coriander, 2 tsp cardamom. Multiply as needed. *Chickpea method and tahini sauce adapted from my Sweet Potato Chickpea Buddha Bowl. *Nutrition information is a rough estimate calculated with beans and vegetables and without any sauce. Hi Yolande, pinning photos on our site with pinterest is a good option for that! Hope that helps! I don’t even know how many times I’ve made this! Love it! I love avocado boats and these look like a couple of yummy options! I usually grill the avocado halves cut side down with lemon and salt, then stuff them. Then I put them back on the grill to warm the other ingredients. So delicious! I love your site Dana! I am just learning in the kitchen but you make things so easy. Thanks a lot for doing this. I had a mashed up avocado with no idea what to do with it, when I suddenly remembered how I’ve been wanting to try this recipe. I went the black bean route and added green and red peppers for more of a avocado scramble and it was delicious! Thanks for the simple yet always tasty recipes! I made the black bean avocado boats, but I also added some diced mango and it was absolutely amazing! I think I’ll try the Mexican inspired recipe…only with chickpeas toasted with the Mexican spices instead of black beans. Yum! OMG!!! I have to make these, especially the black bean ones! My mouth is watering just looking at the pictures. Time to go to the store to get some avocados! Greetings from Geneva, Switzerland! We’ve prepared your Mediterranean Sweet Potato recipe twice in that last two weeks. Love it! Bravo! I still haven’t tried avocado boats yet, but oh man, these look SO tasty!! Need to action this over the weekend! Yum! 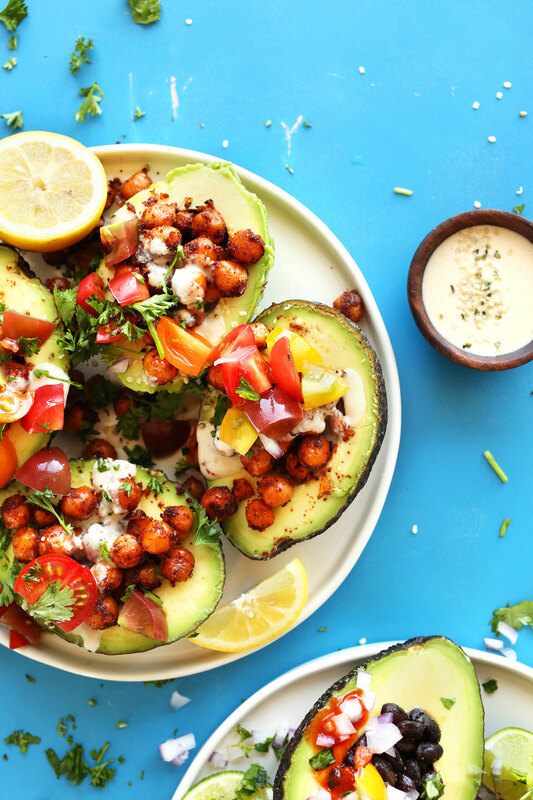 The avocado with the chickpeas looks delicious! I tried to roast chickpeas once, and they just turned into gross little singed nuggets, so maybe I’ll give them another shot for these. This looks like a fun avocado party :) I absolutely love avocados and the idea of avo boats is fantastic–these look delicious!! You’re so right. Boats definitely do = more fun! I’m so inspired now! What else can I turn into a boat? Cantaloupe? Cucumber? Zucchini? The options are endless! Love how super simple these are. I might try a za’atar version too! I went right out and bought some avacados!! This looks so good!! Going for the black bean recipe!! What a great idea! I’ve also heard of baking an egg inside an avocado. That looks good too! Woah! These are beautiful and totally my new favorite way to make avocados.. I love it when you do two in one recipes because then that means both we too good to just choose one! Love! Pinned! These avocado boats have set my imagination adrift. I always scoop a dollop of smashed ago and another of hummus on my salads to make them creamy and wonderful. This spice blend is upping the game! I’ll be sure to give this a try. 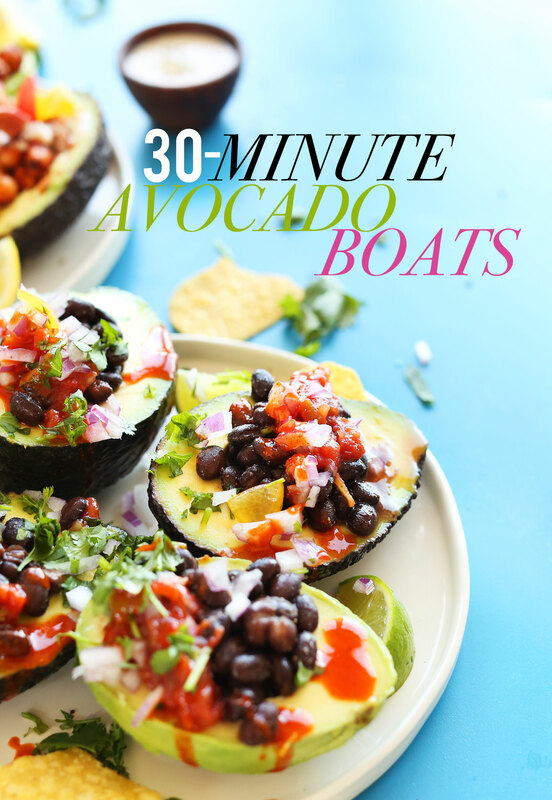 Great idea with using the avocados as boats…I’ll definitely have to try that next time! Both versions sound so good, I have a hard time choosing which one I’ll try first! I’ve never actually eaten an avocado boat before, so I have a fun project now:) Thanks for the cool and refreshing recipes! It looks so delicious !! You are so right about boats! I totally flipped over your papaya boats, and this is really no different. What a fun, gorgeous, easy summer eatable! 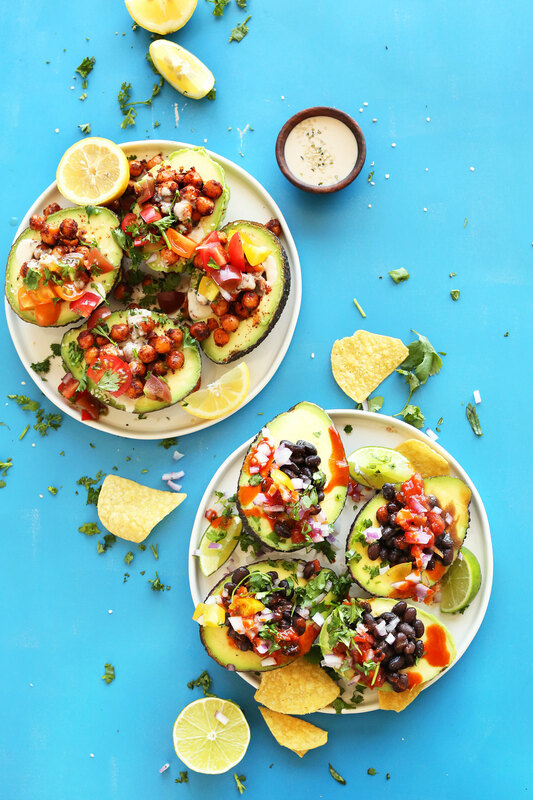 I’ve been eating so many avocados (probably because of their media hype, but I’ve also always loved them, especially in the summer), so this recipe sounds so good to me. Beautiful pics! Avocado boats are SO good!! I love putting tuna salad in mine! What a simple, yet brilliant recipe! I can’t wait to try the Mexican version. I can’t decide which is better! I love both! This looks amazing! So happy I popped by :) Great job. I’m giving the chickpea one a go! Can I get a toot toot? I love these boats and my doctor is going to love these boats for me. Cholesterol STILL too high. But I know that avocados are super good for high cholesterol. My wife doesn’t want me to go on any drugs from the dr. Ok, I think she’s probably right. And I can’t be the only guy out there who eats dinner and feels like I’m starving 20 minutes later. Like how this is filling……honk, I see another boat going by.